× 7 = fifty six Required Please enter the correct value. Tesla Motors Inc. (Nasdaq: TSLA) stock opened down 5% this morning (Friday), a day after Chief Executive Officer Elon Musk unveiled new features to the Tesla Model S sedan at an event in Hawthorne, California. 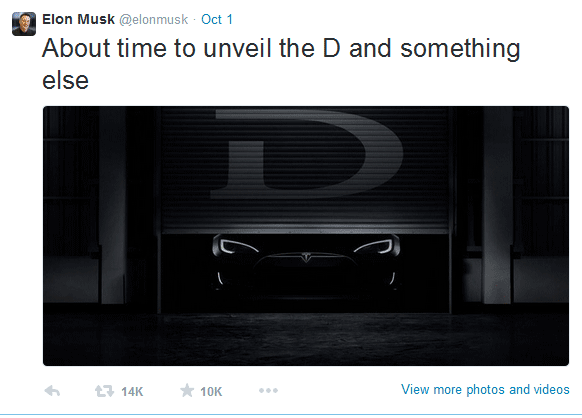 The new features are marketed as "D" which stands for "dual-motor." According to Musk, the new features make the vehicle more powerful, more efficient, and faster. The car can now go from 0 to 60 mph in 3.2 seconds and is equipped with all-wheel drive technology. "This car is nuts. It's like your own personal roller coaster," Musk said at the event. The top speed of the car is now 155 mph, up from the Model S's original 130 mph limit. But the upgrades are not entirely performance based. New safety features are also included. Now, the vehicle will be able to read speed-limit signs and adjust speeds automatically. An “autopilot” feature can recognize lights, pedestrians, and stop signs. The vehicle can also park itself. The all-wheel drive version will cost an additional $4,000, from the Model S's base price of $71,000. The version with all-wheel drive and acceleration-boost, named the P85D, will have a base of $120,000. The P85D will be available in December. The other versions will come to market in February 2015. While the performance upgrades are extensive, they seem to have fallen short of shareholders’ expectations. Last month, Musk said that he wants a fully autonomous Tesla vehicle on the road in the next five to six years. The autopilot features are a first step, but the car still requires heavy driver participation. With today's loss, TSLA stock is now down 13% in the last month. But according to Money Morning's Chief Investment Strategist Keith Fitz-Gerald, Tesla stock is still a great long-term play. "This company is on track to see a stock explosion that will make its surge back in the spring of 2013 look like a speed bump," Fitz-Gerald said. One reason Fitz-Gerald is so bullish on TSLA stock is the company's innovative CEO Elon Musk. Not only is he the man behind Tesla, but he's also the founder of PayPal, SpaceX, and SolarCity Corp. (Nasdaq: SCTY). "You hardly ever see this recognized in the mainstream media, but Tesla has one irreplaceable asset that also happens to be its greatest advantage over its competitors," Fitz-Gerald said. "The company has been blessed with the most innovative CEO on the planet: Elon Musk." "Creativity as a thinker who can't be boxed in by entrenched competitors, the ability to cheerfully put tens of millions of his own money behind his vision when necessary, a solid grasp of what technology means for the industry he operates in… all of these are great qualities in a CEO. Any company, big or small, is lucky to have a chief executive with just two of them. Tesla has all three in Elon Musk." And that's only the first reason he's bullish. The Tesla Gigafactory is also a major catalyst for TSLA stock. Tesla wants to begin construction on the Gigafactory by the end of 2014. The final goal is for the factory to reach maximum output capacity by 2020. At that point, Tesla will power more than 500,000 vehicles annually. "The announced plans for what Tesla is calling a Gigafactory mean that the company is pouring resources into slashing battery costs like never before," Fitz-Gerald said. "This 10 million square-foot factory will have a price tag of $5 billion… hefty, you might say, for a company whose earnings were less than half that in 2013. "But the juice is worth the squeeze. That's because the Gigafactory will be a pioneer in mass production of cost-effective and high-quality battery packs that will give Tesla an even deeper competitive edge over its competitors going forward. It's going to be the largest lithium-ion battery manufacturing plant in the world."